A class of international management students at Eastern Kentucky University are gaining insights into the many difficulties and challenges inherent in doing business across geographic, cultural, institutional and temporal boundaries – by working long distance in four teams with counterparts at a German university. 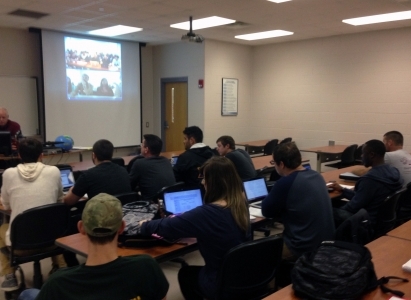 Dr. Allen D. Engle Sr., EKU Foundation professor of management, arranged for his students to work with Professor Bianka Lichtenberger’s human resources class at the Dual Hochschule Baden-Württemberg (DHBW) in Vilingen-Schwenningen. Four teams of EKU international business students have been working since January – through the snowiest semester in 30 plus years – to research and create a “prospectus,” a report on the strategic context of four German-based multinational enterprises. The firms selected were SAP, Siemens, BOSCH and KABA. The reports were uploaded on a shared web based platform operating from the DHBW, named “WILLI”. Four student teams from DHBW are operating as HR consultants to the four EKU management groups, building on the strategic context presented by the Eastern students, to make a series of recommendations for creating proposed job descriptions for four executives and further recommending recruitment and selection and training and development methods and models for the four German firms. “This ‘forced interdependence’ between small teams of three to six students on both sides of the Atlantic gives our EKU student a taste of the issues, processes, relationship building and tolerance for complexity and ambiguity that are realities in today’s global business environment,” Engle said. The shared learning experience is one of several operating at DHBW this term. Other teams in other classes at the Schwenningen campus are working with student groups in Mexico, Spain, and Brazil. The Blended Learning International Coordination consists of EKU, DHBW and schools in Turkey, Spain, Greece, the Czech Republic, Mexico and South Africa. Engle, in his 25th year at EKU, is co-author of the bestselling textbook “International Human Resource Management,” and has held a three-year recurring appointment as a visiting professor at ESCP-Europe (École Supérieure de Commerce de Paris) Europäische Wirtschaftshochschule Berlin since 2007.